Moving into a new property can be unsettling, it takes a little while before it begins to feel like a home. Especially at this time of year. Flowers and plants are known for their positive impact on both physical and mental health, which is why bringing nature into the home is so important. Flowers not only brighten your home, but are also known to make people happier. They appeal to both our sense of smell and sight, evoking positivity and feelings of joy. Our friends at Bunches are giving you the chance to win a three month floral subscription or a Christmas festive bouquet, keep reading to find out how to enter. For a long-lasting Christmas blooms, why not try Carnations. Known for their longevity and strength, they can last up to 2 weeks from bud to bloom. Shades of red and white, are perfect to brighten up your home in time for Christmas. 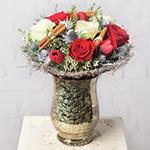 Browse Bunches full range of Christmas bouquets here. For the coveted table centrepiece a Christmas Posy makes for a no-fuss yet still fabulous touch of festivity to the dinner table! If you’re not sure what to choose, then opt for a bouquet that encompasses all the delights of Christmas, think warm scents and bright colours, complemented by white blooms to make a statement. This would be the ideal gift for any host this festive season. 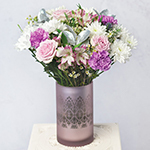 For more of a modern twist on Christmas flowers, why not opt for frosty shades of lilac and silver? Whilst the lilac switches your arrangement from traditional to modern, touches of silver can confirm its deserved place in the home this Christmas. After all, who doesn’t love a bit of sparkle in December! No time to get a Christmas Tree? Mini Conifers can be a quick solution for a loved one who may be in the midst of moving home over the festive season. 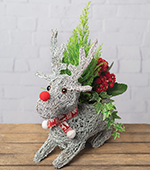 The favourite at Bunches HQ is the charming and lovable Reindeer Planter, made from wicker and wearing his best Fair Isle print scarf, he will be sure to bring joy to all the family and we couldn't agree more. See Bunches full range of festive plants here. Cakes, cheese and wine more of your ‘thing’? A festive hamper may be the right treat for you and your loved ones. From savoury to sweet, it is a truly thoughtful gift that is the faultless ‘night before Christmas’ gift to unwrap and get cosy with next to a long burning fire. To make your home stand out this Christmas with festive charm our friends at Bunches are giving one lucky reader the chance to win a three month flower subscription as well as also giving 7 readers the chance to win a Christmas Nutcracker bouquet, just in time for the festivities! 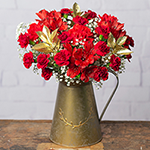 *Expires 31st December and offer excludes flower subscription gifts and flowers for a year.